Battle of the Axis Powers! GTR vs RS5! 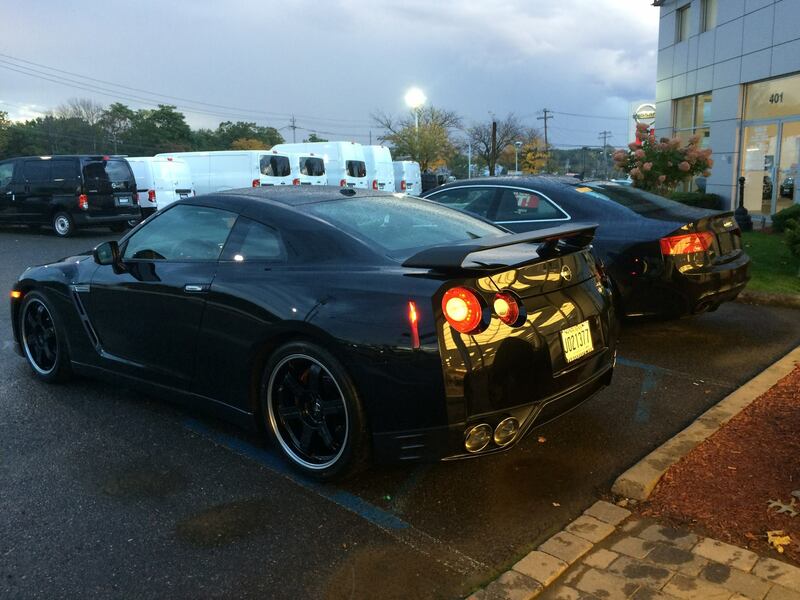 As promised last entry, I want to provide my impressions of how the 2014 GTR Black Edition stacks up against the 2009 GTR Premium that I owned a couple of years back. While I’m at it, though, I decided that it would also be value to provide some insights into how it also compares to the departed RS5 while that car is still very much fresh in my mind. Rather than take my usual meandering and prosaic approach, this time I’m going to do this in a really structured way as I think it better suits the topic. So let’s get to it! This wing is $9000 and is extremely well fabricated. 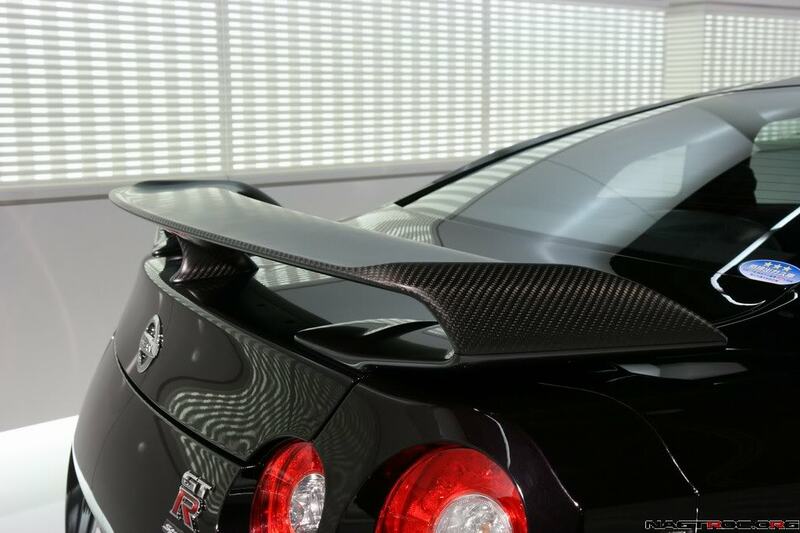 The dark grey effect of the carbon fiber also nicely complements the similarly grey hardened plastic lower bits around the sides, front and rear of the GTR. 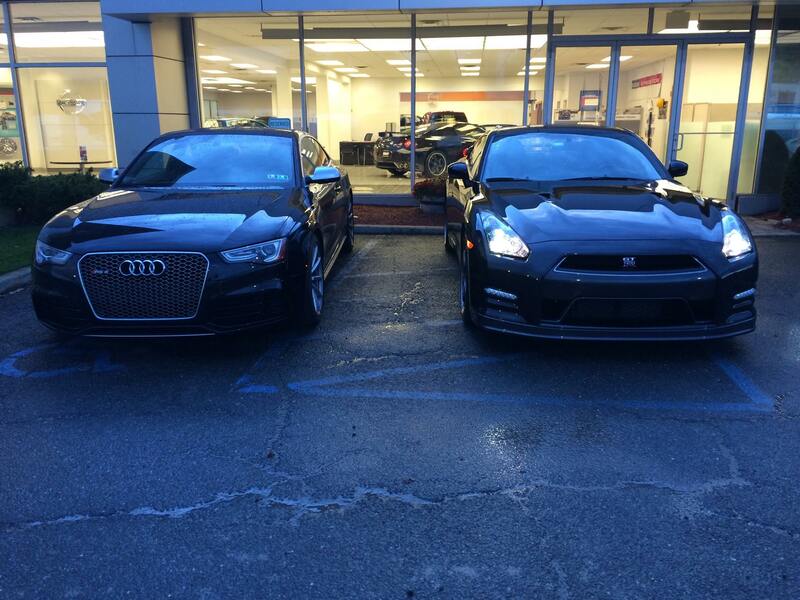 Other than these differences, the 2014 Black Edition is physically pretty much identical to the 09 Premium. There are tweaks here and there worth noting for enthusiast, but anyone who doesn’t really know the car would never spot them. 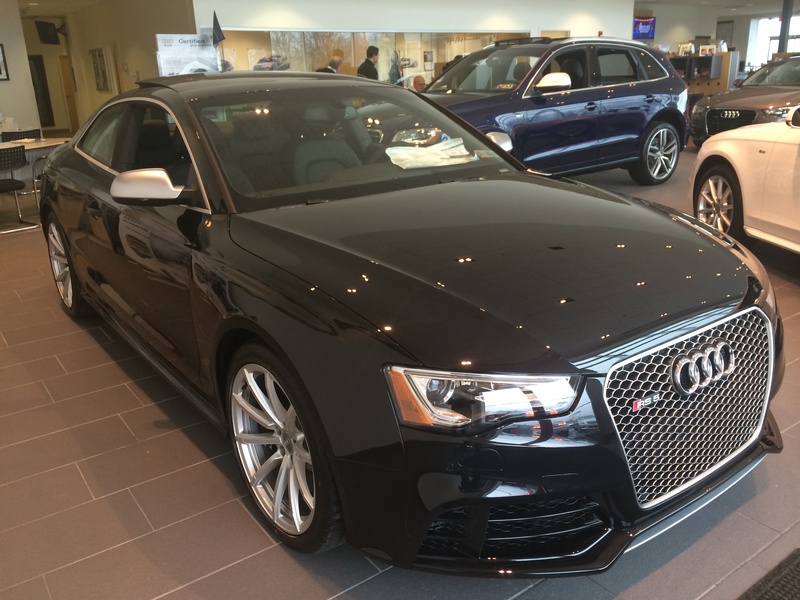 The RS5 is an extension of the S5 design which itself is an extension of the lovely A5. Audis equivalent of the BMW 3 series coupe (now 4 series – BMW taking the page from Audis book of separating coupes and sedans into separate lines), the A5 is a two door version of the A4. The design has been around a good while now, but it is quite timeless and I think most would agree that it is one of the nicer small luxury cars on the road. Unlike the GTR, this is a design that can inspire neutrality and rarely inspires any purely negative feedback. As befits an RS model, the RS5 diverges from the base car in a few subtle ways, but they add up to a very significant net impact. Taken in isolation it might be easy to dismiss them as similar, but seem together the difference is dramatic. For one, the RS5 is about 6mm wider, but with sculpted sides that accentuate this flare. It also sports a different grill with a hexagonal chain link pattern vs the horizontal slats of the A5/S5 and a more aggressive (and lower) front air dam. In the rear, the RS5 gets a rear deck lip as well as a speed deployed rear deck lid spoiler a la the 911. Rounding out the accents out back are a rear diffuser and a pair of massive oval exhaust tips. Anyone who likes the A5 look (most people) will certainly love the RS enhancements. On the downside, the RS5 is solidly “German luxury coupe” and will never be mistaken for an exotic. There is no “woah! what the heck is THAT car!” with the Audi. This is the downside to a design that isn’t extreme. To get this effect from Audi you really need to step up to the $160k R8. In terms of build quality, Audi is really knocking it out of the park these days. A casual walk around on the RS5 is confidence inspiring. Visible seams are minimized and where there are any, the gaps are millimeter perfect. The entire thing just looks solid and the quality of the paint finish is very high. Better than the GTR. Of course how these two black cars would hold up over time is a different story. I suspect they’d be similar. Both cars look high dollar, but the more expensive (by a lot) GTR probably just loses in terms of fit and finish to the cheaper Audi. Let’s talk good and bad first. The good is that there is actually a fair bit of leather going on there including lower dash, door pulls and shift knob, and in the 2014, it is stitched leather which looks great. The other good thing is, as you can see, the center console controls are intuitive and well presented to the driver. The steering wheel is meaty and provides great grip. The faux aluminum bits are now a darker silver rather than the light silver painted parts in the 09 that scratched when you breathed on them and immediately looked horrible as a result. On the not so good side the look of the center console is a disaster. The latest models have added carbon fiber overlays that help a bit, but they aren’t high enough quality. The vent style and placement is also a bit odd. The seats, on the other hand, are phenomenal. Especially the special edition Recaros in the Black Edition which are solid feeling two toned leather and provide unbelievable, better than 911 Turbo sport seats, support. In comparison, the 09 Premium was all of this but worse. Nissan has done a good job, on the Black Edition in particular, of making the inside cabin a premium experience. It is far better than the E92 M3 was, by comparison and the fit and finish of every surface is good and solid. The doors close with a nice thud and all the levers and buttons have good response. Some exceptions are the center console knobs which do feel a bit cheap and rubbery (ahem… parts bin) and the mode switchgear for the selectable drive dynamics options aren’t as “weighty” and solid feeling as you might expect. Despite all the noises the car makes, none of them originate from “bits” rattling. On the modern BMWs I’ve had (post E46), this is not the case and everything in cabin starts to “loosen up” a bit after a year or two. In terms of design language, Audi excels. The layout is fantastic and looks as good as it works with terrific ergonomics. The controls might be slightly less intuitive though, compared to the GTR, primarily due to the iDrive-esque controller used by Audi MMI. The seats are wonderfully supportive and extremely comfortable. More comfortable, but less supportive than the GTR. I had the much maligned comfort seat option which trades the usual aggressive RS sport seats for actively cooled “sporty” seats, so this makes sense. The not so good bits are the aforementioned plastics. There are a lot of them (the entire dash), which is not so unusual, but they’re pretty much the same plastics you’d find in an A3 (and maybe even a VW!). This is a bit of a letdown for a car that is upwards of $80k. 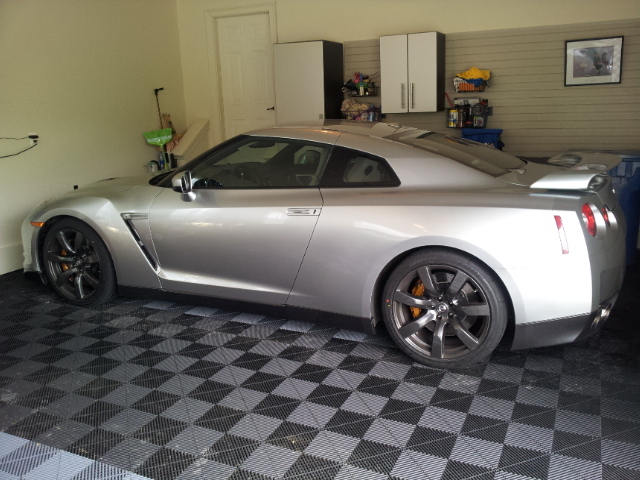 Here is an area where the years have been unkind to the GTR in general, but more unkind to the 09. In the ’14 at least, all of the bases are covered – XM radio, USB/iPod interface, Bluetooth with audio streaming, GPS and a nice LCD. In the 09 the LCD was less nice, the system was a bit slower, XM radio was missing and it had neither the iPod interface nor bluetooth audio streaming. Tech is an unforgiving master and time marches on quickly. The GTR is a decidedly last gen in car entertainment system, even on the ’14. This actually isn’t necessarily bad, it’s just that you’re not going to find connected apps, a WiFi hotspot, or any of other “car meets tablet meets internet cafe” bells and whistles. Of course it’s also arguable how necessary or realistically practical any of that stuff is. The standard data is there as well providing current vehicle health (time to next service, active tire pressure, oil level, etc), settings customization for a variety of areas, and system info (firmware rev). In addition to the infotainment the GTR also figures (pause for a big breath): auto lights, auto wipers, auto this, auto that, folding mirrors, two zone auto climate control, backup camera (on the ’14, no luck on the 09 and on the GTR you really need it), heated seats, power everything and a partridge in a pair tree. All of this is boiler plate stuff for cars in this class and nothing is left out. Now let’s shift gears (no pun intended) and focus on the parts that make the car go. As cars inch towards essentially being rolling supercomputers, the GTR blazes the trail. Everything is actively monitored and adjusted by a control system. The AWD shifts torque back and forth based on driving pattern as well as vectoring left and right in response to cornering inputs. The AWD behavior can be controlled using one of the center consoles three “because race car” switches and offers three settings: snow mode which disables the VDC (vehicle dynamic control) and effectively locks the torque split, normal mode which lets it do its thing, and race mode which lets it do its thing more aggressively. Similarly, the transmission is a dual clutch affair, whereby a manual transmission but with two clutch plates is paired with electronic control rather than mechanical. It’s a rugged, noisy, aggressive beast of a box. Particularly compared to far more refined systems that are found inside Porsches, Audis and BMWs. Because racecar! There is a noticeable improvement in refinement at low speeds between the 09 and the 2014. It’s night and day really and is attributable to updated transmission control unit (TCU) software. Side note… This can be retrofitted onto the 09s using an aftermarket tool. There have been some physical changes over the years as well which, of course, cannot. As with the VDC, the transmission behavior can also be controlled via toggle switch and has three settings. In this case they are “save mode” which is also for snow and holds low gear, “normal” which provides a dynamic balance between aggressive shifting and smooth shifting based on conditions, but with a bias towards smooth, and “race” which has the opposite bias. Last but not least, the suspension is actively controlled as well. The suspension toggle allows you to switch between “a little less brutal” (comfort), “fairly brutal” (normal) and “save it for the track” (race). Here is another area where the ’14 separates itself from the 09. In the ’14 you really can tell that the dampening is more forgiving in comfort mode. On the 09 you were left wondering if the switch was working! Beyond the stuff you can control are the things you cannot. 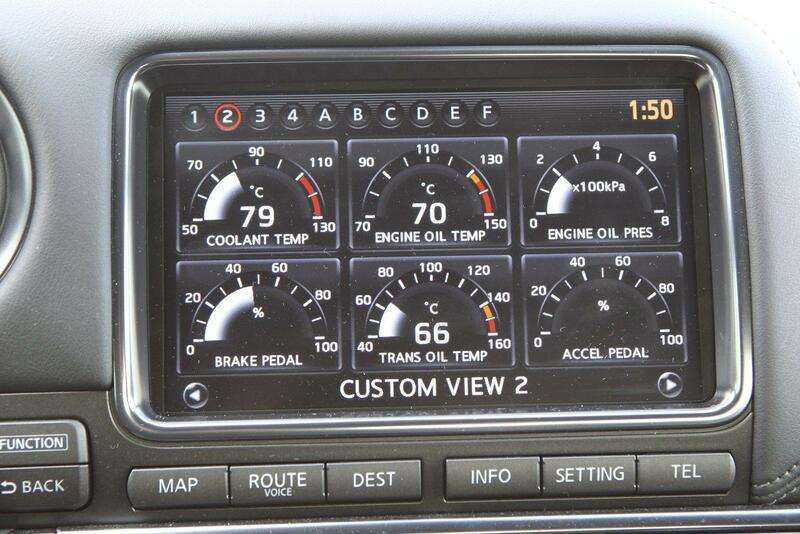 The GTR ECU is constantly busy and the turbo and fuel systems are track grade even in the base models. All of these systems are more advanced in ’14 than they were in 09, but you can’t really feel that day to day. What you can feel is the steering. “Dynamically controlled in proportion to speed” in theory, in practice, the steering is always very very heavy. At low speeds during parking maneuvers it’s almost like driving an old rack and pinion (almost), but at speed its absolutely brilliant with fantastic response and feedback. I didn’t detect any significant difference in steering weight from 09 to ’14. As with many things GTR, the bias is towards performance leaving humdrum usability slightly compromised. As in car entertainment systems go, the Audi MMI is right on the cutting edge. It’s basically an Android Tegra 4 tablet. 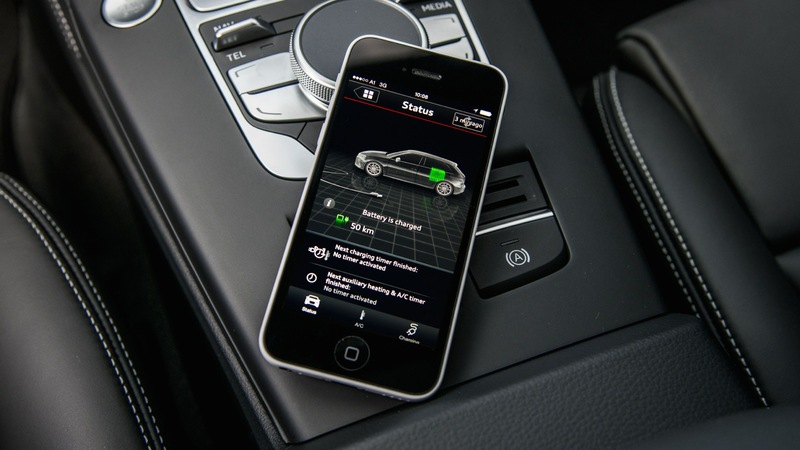 The nav system is supplemented by Google Earth and Audi provides a set of in car apps. It can’t be customized, nor can you get at the Android shell, however, and it all feels a bit slow (slower than normal even for Android which always feels slow to me). The basic nav, sans Google, isn’t bad. The car is also equipped with its own cellular radio (T-Mobile 3G), the downsides being 3G and the fact that it carries an extra bill for service. Once enabled you can do magic feeling things like Google search a point of interest right from the car and set it as a destination. Obviously all of the usual stuff is there as well, fully functional bluetooth, iPod/AUX interface and voice commands. Building on the rich data capabilities MMI adds WiFi hot spot functionality and an IOS app which allows an “i device” to link up and do various things. In terms of car control systems, Audi is one of the few marques that matches the GTR almost point for point in sophistication. Quattro has come a long way and is unbelievably capable (and complex) these days with full torque vectoring abilities. Rather than toggle switches, subsystem behavior is controlled via the MMI. 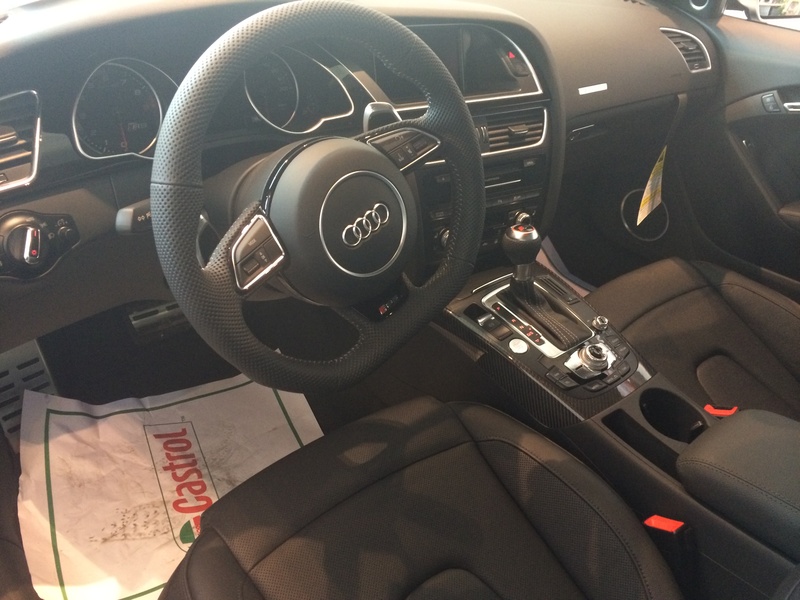 Audi provides 3 levels of settings: comfort, dynamic, and auto. Dynamic is comparable in concept to the race modes on the GTR and firms everything up. In the case of Quattro it prefers rear bias and its torque shifting is both aggressive and performance focused. Comfort goes the opposite route and auto attempts to strike a balance based on current driving conditions. The S-Tronic transmission is a dual clutch box also, but a very different one than the GTR. It’s every bit as quick and sharp in dynamic mode, but it is far smoother in comfort. A typical driver might actually be fooled into thinking its a torque converter automatic. In manual mode or dynamic though, the violent throttle blips on downshift and instantaneous upshifts tell a different tale. One interesting thing worth noting is that S-Tronic is much more livable in Dynamic mode than I found BMW DCT to be (on the E92 M3) in S5. It is also the quietest dual clutch I’ve ever driven. With the GTR you hear the turning of every gear and rattling of every plate, with the S-Tronic you literally don’t hear anything regardless of mode. Rounding out the “Drive Select” systems are throttle and steering. Dynamic throttle controls means that the gas pedal is now digital rather than analog. Pressing the pedal really hard will have an effect determined by the computer reading the pedal input. Even a heavy foot might lead to a reasonably tame response in comfort mode whereas in dynamic mode, you’ll be flying. This particular gimmick is also present on the E92 M3, but absent on the GTR. Of all of the control systems, I personally find throttle the least noticeable, but it’s generally harmless. Steering, on the other hand, is extremely controversial. The RS5 implements electronically controlled power steering. I think of this system as the devil. The idea is that variable hydraulic power steering (as on the E92 M3 or GTR) isn’t enough. Instead steering wheel input also becomes digital and is parsed by a computer. The idea is that around town or in the mall parking lot the car can be driven around with one finger, while on the highway at speed it transforms into a proper sportscar. Great in theory but, in my experience, these systems feel vague and imprecise in practice and never seem to be in the right mode at the right time. That said, parking the RS5 is effortless and the low speed steering isn’t as light as lesser Audis which is a good thing. Once again these two settings are influenced by the comfort, dynamic and auto modes. Once again alongside the gee whiz bits come the now baseline set of power everything, auto everything, adjustable everything. Plus blind spot detection! Handier than it might sound. But no folding mirrors like on the GTR (’14, not ’09). These are also handier than they might seem. Unfortunately you really can’t have it all! We’ve already touched on some of these points, but they are worth reviewing. All driver controls in the GTR are extremely intuitive with excellent ergonomics. Everything you need is in reach and the placement is logical. The seating position is excellent, if a bit high, and forward visibility is very good. The nose is a bit long, and the hood has bulges, so it can be hard sometimes to get a sense of the cars “edges”, but this is a bit subjective. I feel the same way (a bit worse actually) in a Corvette or Viper, but not in a 911. Others may not notice it at all. The steering wheel both tilts and telescopes and finding the optimal position is very easy. Seat adjustability is also excellent with 8 way control and a heating element. The custom branded Recaro seats are extremely firm in the Black Edition, but they are also extremely supportive. The 09 Premium had standard seats which were a leather/faux suede mix, also quite supportive, but a good bit softer (also made or at least designed by Recaro, I believe). The backseats do exist, but things are very tight back there with limited leg and headroom. Men, women and children below 5’8″ or so should be ok, especially for short rides. Up front its much, much roomier with both the driver and passenger having plenty of head, shoulder and leg room. Starting the car up works just the way any modern keyless entry system does. Have the key somewhere on you, step on the brake, and push the start button. The GTR roars to life with an overwhelming sense of occasion. The dual clutch transmission comes online in a wave of mechanical chattering that can be disconcerting to the uninitiated. The engine is loud, as are the turbos, in a uniquely “big forced induction” way that most tend to either love or hate. The cabin has some sound deadening, but not too much (every pound counts), so much of the cacophony is unfiltered. The 09 was the same on all counts but worse. Word has it the ’15 is the same but better. For any of them, in my opinion, you have to like it to take it. Me? I like it! Getting the car rolling the first thing most will notice is that the steering is heavy. The more used to modern electrically assisted power steering systems you are, the heavier it will seem. At low speeds (puttering in and out of a garage or around a parking lot), the GTR can feel a bit clunky and ungainly. The ’14 transmission is far better in this regard and none of it is a showstopper anymore (quite frankly I never thought the 09 was all that bad, but it was too much for many) The second thing you’ll notice is that there is pretty much no turbo lag. The throttle is a bit heavy also but it is also forgiving. Too light throttle application and Godzilla isn’t very interested, you’ve got some margin of error it rampages though, so the power is easy to modulate. This is key to the now legendary accessibility of the GTRs massive performance potential. As the car gets rolling you’ll notice that the ride is very firm. On harsh roads it can be jarring. The 20″ wheels and runflats don’t help. Non runflats make a big difference. Comfort mode on the ’14 helps a fair bit also by relaxing the dampeners. At speed the GTR really comes alive and getting to speed happens fast. Fast enough that you have to watch yourself so you don’t end up in jail. Very few (almost none) reasonably common cars have this kind of acceleration straight from the factory and none make it this easy to use except the 911 Turbo. You can be doing 100MPH quite literally before you know it and while the car absolutely communicates what is happening extremely well, it is also just completely composed while doing it. So you can feel the speed, but the car never feels unsure of itself, and it’s all building very fast. Given all of this it’s probably important that the brakes work too. The good news is that they do. Professional mags have recorded stopping distances from 60-0 at around 105ft. 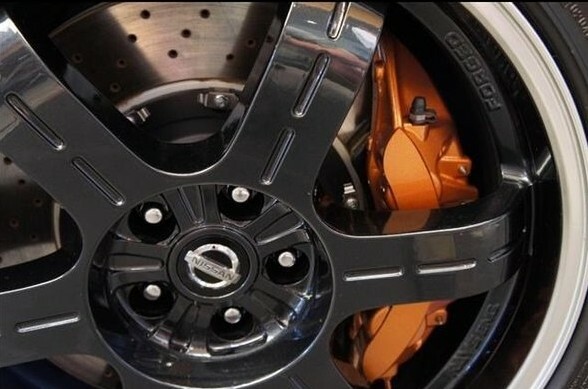 This is fantastic and with the well ventilated rotors, there won’t be any brake fade on the street. As well as they stop they feel like they stop even better which is also important. There isn’t any drama, just extremely confident action, excellent pedal modulation and a firm stop. It might come as a surprise to the majority of internet bench racers, but eventually a car tends to have to turn! When that time comes that overly heavy steering at low speeds suddenly becomes a wonder. The steering is extremely direct and communicative. None of the synthetic “is there a road there?” vaguery that comes with even the best electrical systems. I don’t know that it exceeds the steering feel of an M3 (pre EPS), NSX or 911 (pre EPS), my benchmarks, but it’s absolutely up there. The aggregate of all of these experiences is that you always feel in control of the GTR. It’s very confidence inspiring. There is zero body roll which is surprising for such a heavy car. I like to view a cars subjective level of driver engagement based on how close what I perceive the car to be doing, and where it’s wheels actually are, to reality. In this respect the GTR is very, very good. These qualities aren’t unique to the 09, the ’14 shares them as well, but all of the little tweaks Nissan makes each year do add up to a noticeable, if subtle, overall improvement. The 09 felt great, the ’14 feels better. In comparison to the GTR, it’s probably best to speak in terms of deltas with the RS5. It is more comfortable in every way. The suspension, while still pretty firm – especially with optional 20s, is more compliant and the seats are more comfortable (comfort seats remember), but less supportive. The entire cabin is a quieter place to be with no real mechanical chatter. Push start and she purs to life with a subtle grumble and no “WTF is that?” moment. The ergonomics are just as good, as is the driver position and the adjustability of the seats. Visibility all around is similar and the view out the front is subjectively a bit better courtesy of the shorter nose and smoother hood. There is a fair bit more room for passengers in the back, but you certainly won’t be ferrying giants around either. Getting going the car feels almost the same as an automatic equipped Audi A5. The dual clutch really is that smooth and the electronic brain governing throttle and steering are most convincing at low speed. As mentioned the steering feels really boosted, and is extremely light during parking maneuvers, but it is heavier than a 428i or new Audi S4. Once rolling it does firm up nicely and feels good at speed. It’s never truly direct though and it does maintain that subtle vaguery that is a feature of EPS. The RS5 definitely passes my “do I know what the car is doing and where it is?” test and the response to driver inputs is very direct, it’s just that benchmarked against the likes of a GTR, E92 M3, 911 or NSX it comes up short in terms of how much of the road is communicated through the wheel. There is also a bit (not much mind you, but it’s there) of body roll comparatively. This makes sense as those aforementioned cars were all built specifically with varying levels of track duty in mind whereas the RS5 was really designed for extremely high speed cruising (think Autobahn). Stabbing the go pedal is an interesting experience for a number of reasons. First is the electronic brain behind the throttle which, depending on the current driving mode, will impact how much throttle you need to give to get moving. Second is the nature of the engine itself. The RS5 uses a wonderful, normally aspirated, high reving small block V8. 450 horsepower out of 4.2 liters at 8250RPM. Engines like this are a very specific experience in that they have massive top end, and a rev happy nature that hauls when you goose them, but they produce proportionately low torque down low. There is no tire twisting, axle bending, explosion of force unless you really gun it. If you do that, then look out! This takes some getting used to for folks who are used to relying entirely on low RPM torque to get moving (particularly folks from well tuned turbo applications). The dual clutch is butter smooth and almost never misses a beat. In dynamic mode downshifts are accompanied by a booming and aggressive blip of the throttle. Upshifts are blink of an eye quick. In dynamic it’s very smart about holding the revs without getting too crazy based on driving conditions, in comfort it isn’t too lazy and is perfect for daily driving duty. On the surface it seems like the S-Tronic is just superior to the GTR dual clutch in every way, and for most drivers in most situations that is almost certainly true. It’s worth noting though that the GTR transmission is handling a lot more power and a ton more torque and can handle even more still just fine. It also never misses a beat when it counts the most which is flying along a racetrack. So once again, the GTR makes concession to “because racecar” that the Audi doesn’t bother with. The Audi, instead, goes the other way and makes concessions to “high speed luxury cruiser”. When its time to stop the brakes also feel great, but not GTR great. Confidence is just a bit lower, although pedal modulation is good and stopping distances are too. The same actually, as the GTR at about 104 feet from 60. On the street its all fine, on the track you can see how the GTR would be the better companion. Overall the RS5 driving experience is an interesting one. To me it slots somewhere in between the M3 and the C63. Not an outright muscle car like the AMG is, with brutish torque and a tail happy character, it still feels more muscular than the E92 M3 which is a much more surgical instrument in terms of feel despite also carrying a high revving small V8 and not being that much lighter. I think all of these cars, though, are within a stones throw of each other and are amazing both on a track, and off. Light years beyond both luxury cars of just ten years ago in terms of comfort, technology and durability and sports cars of the same time period in terms of acceleration, braking and handling. Really incredible stuff! The GTR, on the other hand, was built to, and successfully does, battle the 911 Turbo S. It’s a different class really, and even a short drive on local roads demonstrates that. The RS5 is absolutely easier than the GTR though. As accessible as the GTR is, it’s accessible for a supercar. The RS5 is a high performance coupe that rolls just like a normal car. There is a big difference. Handing the GTR over to a stranger I’d have some concerns potentially just because of the points called out above. Not Viper level concerns, but there is some instruction required. The RS5, conversely, is a lot like the S5 much of the time. This can be bad, this can be good. It all depends on priorities. Before wrapping this one up I think the aural experience of these two beasts needs to be discussed if for no other reason than that they are so dramatically different. We’ve talked about how the RS5 uses a high revving small block V8. My RS5 was also equipped with the factory sport exhaust. If there is one thing I will miss about the RS5 (possibly as long as I live!) it is the soundtrack. I can honestly say that nothing short of a Ferrari sounds as good as the RS5 for below $300k. It is significantly better than the M3 sound. Some might argue in favor of other cars, and that’s where it gets subjective, but as a specific representation of an 8000RPM V8 (which is a very unique thing) the RS5 is just phenomenal. Not just exhaust either, but also the actual engine. I find these days the vast majority of “enthusiasts” really don’t even know the difference and focus entirely on exhaust sound. This really is because most actual engines just don’t sound all that impressive. High revving engines do. Both 8 cylinder (Ferrari, E92 M3, RS5) and 6 (911 GT3, NSX) As for the exhaust, that sounds incredible also and the valving ensures that she only screams when you’re really gunning it, not when you’re rolling out of the garage at 6am. Great stuff indeed. As for the GTR, the soundtrack is possibly one of the most unique in production. The whooshing, chattering, clunking and grunting really does make you feel like you’re in a racecar. The turbos and VR38DETT V6 sound a lot like a jet engine. The stock exhaust doesn’t have the guttural growl, or high pitched scream, of some of the aftermarket parts, but it does make a music of its own that sounds fantastic. All in all the total package is a racier, more technical, but really less exotic experience than the RS5. That’s probably a good note to conclude on actually. If you’ve hung in there this long you can probably guess it, but in the final accounting the GTR is a race car for the street that a normal person can drive, but in doing so they will pay some tax for the privilege. It can punish you in ways that a normal car wouldn’t, but it can still do plenty of normal car duty realistically (carrying passengers, driving daily, driving in snow). Matching its absolute performance with a warrantied, factory stock car isn’t easy no matter what your budget might be, but below $150k it’s pretty much impossible. This performance characteristic hasn’t gone unnoticed and, as a result, the car has become a legend. It’s also rare enough, and expensive enough, that it has crossed into exotic territory and carries all of the good, and bad, which that status brings. The changes Nissan has made over the years are possibly the most impressive part of the GTR experience. Having direct experience now with both the earliest model and the (almost) most recent I can say that the current ones really are a whole different car. The 2009 was a great starting point, but it needed to go in the direction its gone. For the Black Edition the changes are limited in 2015 (the softer suspension is a Premium model change), but even the self adjusting and leveling headlights present truly effective and impressive value to the driver. I have no doubt that Nissan will not be resting and you have to respect that. The RS5 is a different thing altogether. It’s a high speed cruiser than can ferry a banker to work on the Autobahn in style during the week, and still handle a solid track day on the weekend and hang in there with the likes of an M3 or 911. This is equally impressive in its own way. The performance is obviously a big step down from the GTR, but the comfort, luxury, and practicality are a big step up as well. The RS5 is very much a “sleeper”, in some ways. Most of the population would simply assume it is a highly sensible and nicely setup A5 (or at least an Audi coupe of some sort). A very “no apologies” car, an Audi is the type of vehicle you can bring anywhere. Enough cachet to satisfy brand snobs, but not really enough to offend the reflexively anti-brand. To enthusiasts, and especially Audi fans, the RS badge says it all. There is no doubt that this is a special car even if it is hiding in standard clothing. So how to sum this up in two lines? If your goal is no holds barred performance, and a true supercar experience, in a quirky but exotic package with a heritage that challenges the elite status quo, then the GTR is the car. If the goal is high speed luxury in a wolf in sheeps clothing package that requires neither apologies nor expectations and brings a luxury marque ownership experience to true enthusiast car ownership, then the RS5 is the car. Pushing the DR Easy Button – vCloud Air DRaaS!